Chemists in the UK have developed a possible alternative to protamine, a molecule used by doctors to counteract the effects of anti-clotting drugs. Unlike protamine, the new molecule should easily break down into less toxic metabolites, although it hasn't yet been tested in human blood or plasma. Physicians often use anti-clotting agents to treat blood disorders, or to prevent blood clotting during surgery. One of the most popular anti-clotting agents is heparin, which has been used since the 1930s. But in order to combat dangerous overdoses of heparin, or to inactivate it after surgery is complete, physicians need a heparin binder. The only clinically approved heparin binder is protamine, but this agent sometimes causes severe allergic reactions, so scientists are keen to develop alternatives. Heparin is negatively charged, so the protamine alternatives developed so far have mostly been positively charged, like protamine itself. But positively charged polymers are often toxic, and these alternatives have proved unsuitable for clinical use. Now, however, David Smith and colleagues at the University of York have developed heparin binders that only temporarily become positively charged, so the risk of an allergic reaction is reduced. The molecules developed by Smith's group contain hydrophobic units that self-assemble in water into spherical nanostructures of a similar size to protamine. These nanostructures have branches of positive charge to aid binding to heparin. Indeed, during in vitro tests in salt solutions, the protamine alternative was 'directly comparable to, if not a little bit better than, protamine,' says Smith. 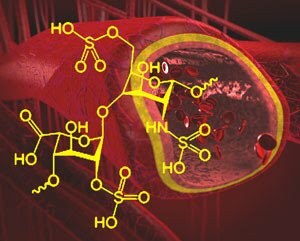 'The interesting aspect of this work is that the designed heparin antidote is much smaller at a molecular level [than protamine].and is expected to bio-degrade to innocuous products, thereby functioning under in vivo conditions in a more predictable and less noxious manner,' says Umesh Desai, a medicinal chemist at Virginia Commonwealth University in the US. Desai and other chemists say the molecule should have been tested in blood or plasma, where its effectiveness - and toxicity - may be different. Smith is already working on this to see whether biological fluids interfere with binding. 'Overall, I would say this is an interesting approach but with a long way to go to prove itself as a protamine alternative,' says Bob Linhardt, a heparin expert at the Rensselaer Polytechnic Institute in New York, US.